Pope Saint Alexander I was the bishop of Rome for seven to ten years in the early second century. According to Catholic tradition, the dates of his episcopacy are estimated from as early as 106-115 and as late as 109-119 C.E. Tradition holds that Alexander I converted the Roman governor Hermes and 1,500 members of his family, servants, and government officials to Christianity. Like all of the early popes, he is honored as a saint and a martyr. He was formerly credited with instituting several church traditions, but much of this is now doubted by secular and Catholic scholars alike. Alexander's feast day is celebrated on May 3. From 1960, the Roman Calendar no longer lists him as a martyr, as his cause of death cannot be historically confirmed. A Roman who was named after his father, Alexander, was reportedly born at "Caput Tauri," thought to refer to the area of Esquiline Hill, one of the Seven hills of Rome. Nothing is known of his life before he took office. Some sources say his episcopacy lasted seven years, others ten. According to the Liber Pontificalis, it was Alexander I who inserted the narration of the Last Supper (the Qui pridie) into the Catholic mass. However, this claim is now considered to be anachronistic by both Catholic and non-Catholic experts. It is viewed as a product of the agenda of Liber Pontificalis—this section of the book was probably written in the late fifth century—to show an ancient pattern of the earliest bishops of Rome ruling the church by papal decree. Alexander I in the Sistine Chapel. Alexander I is also said to have introduced the use of holy water and salt for the purification of Christian homes from evil influences, as well as the custom of mixing water with the sacramental wine of the Eucharist. All this, too, is considered unlikely, as is the report that he ordained six priests, two deacons, and five bishops, since these offices are not thought to have been defined as such yet in his time. However, it is certainly possible that Alexander, whether acting singly or part of a collective leadership at Rome, played an important part in the governance of the church and the evolution of its emerging liturgical and administrative tradition. Liber Pontificalis also reports that Alexander suffered martyrdom by beheading, probably under the Roman Emperor Trajan (or possibly Hadrian). The priest Eventius and the deacon Theodulus are said to have died with him outside of Rome. However, Irenaeus of Lyons, writing much earlier than the Liber Pontificalis, does not know of this tradition. Since Liber Pontificalis reports that all the early popes were martyrs, the accuracy of this report is now treated with skepticism. The date of his death is given as May 3, and he was buried on the Via Nomentana, where his execution took place. Although little is known of Alexander I with certainty, he became part of a time-honored tradition that views each of the early popes as both saints and martyrs. Three Christian martyrs named Alexander, Eventius, and Theodulus were indeed buried along the Via Nomentana, but it is now thought that Alexander I was was a different Alexander—probably mistakenly identified as one of the martyrs by the writer of Liber Pontificalis or his source. His remains are said to have been transferred to Freising in Bavaria, Germany in 834 C.E. A later tradition holds that in the reign of Emperor Hadrian, Alexander I converted the Roman governor Hermes by miraculous means, together with his entire household of 1500 souls. 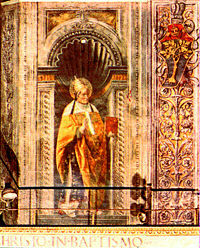 Saint Quirinus of Neuss, who was Alexander's supposed jailer, and Quirinus' daughter Saint Balbina were also among his converts. Alexander's feast day is celebrated on May 3, the traditional date of his death. The identification of Alexander as a martyr was removed from the Roman Calendar by Pope John XXIII in 1960 as lacking historical basis. ↑ E. Cobham Brewer, A Dictionary of Miracles (London: Chatto and Windus, 1901). Retrieved November 26, 2008. Benedict XVI. The Roman Martyrology. Gardners Books, 2007. ISBN 9780548133743. Chapman, John. Studies on the Early Papacy. Port Washington, NY: Kennikat Press, 1971. ISBN 9781901157604. Fortescue, Adrian, and Scott M. P. Reid. The Early Papacy: To the Synod of Chalcedon in 451. Southampton: Saint Austin Press, 1997. ISBN 9781901157604. Loomis, Louise Ropes. The Book of Popes (Liber Pontificalis). Merchantville, NJ: Evolution Publishing. ISBN 1889758868. History of "Pope Alexander I"
This page was last modified on 31 March 2019, at 22:40.